The farm and all the products that it produces are certified organic by the Kootenay Local Agricultural Society under the Kootenay Mountain Grown program. Music is ‘Mad Dogs and Englishmen’ by Noel Coward. The controls below allow you to turn it off if you want to. 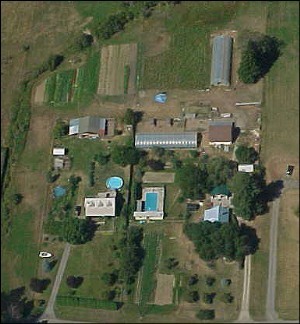 We are a small organic 28 acres farm in the heart of the Kootenay district of British Columbia. We have 10 acres under cultivation at any one time, growing a wide range of vegetables from A-Z (aubergines-Zucchinis), plus fruits and herbs. As farmers, we have a passion for growing, for local agriculture and for preserving heritage varieties of vegetables and other food crops. We abhor the use of chemicals - pesticides, herbicides or whatever-cides and all our farm products are organically grown and certified by the Kootenay Mountain Grown program via the Kootenay Local Agricultural Society of whom we are staunch supporters. Although we are fully supportive of certified products and the certification process, we are great believers in consumer certification and thus, we have an open farm policy and have several farm tours each year for the local schools, our commercial customers and our own farm customers. There is no better situation than when the consumer knows exactly where their food has come from, who grew it and how it was grown. We experiment a lot, both with our growing methods and the type of crops that can be grown in our region. We love our potatoes and hence grow 42 different heritage varieties and we also maintain 7 different varieties of Jerusalem Artichokes amongst many other crops. 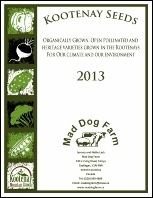 As part of the philosophy of Mad Dog Farm is to develop a completely sustainable environment, we have been actively and meticulously breeding and maintaining our own seed stock, the surplus of which is available through our seed business. In 2009, we started keeping bees for the pollination of our crops. This has now developed into a real passion and at present we have 23 hives going into the winter with plans to expand our apiary in 2012, possibly up to 50 hives on the farm. Not only do the bees provide the service of pollinating our crops, they produce wonderful, clear, light honey for us to consume and sell, and their wax and honey is one of the main ingredients for our own lip balms and hand creams which we have developed with pure, natural, pronounceable ingredients that not only protects and heals but is safe enough to eat. 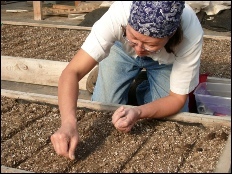 Nette planting rows of seed in a greenhouse bed. 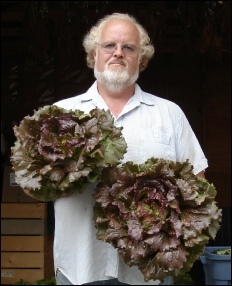 Jeremy holding two Kootenay Rose lettuces developed on the farm. 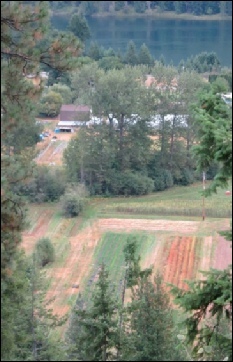 Looking down on the farm after a very long and hot summer. We have exciting plans for 2012, one of which is the re-introduction of animals to the farm. We hope to start breeding and raising Kathadin sheep again for meat – we started this farm with these and we will now be coming full circle. These will be raised organically of course, on rotating pastures for their health and welfare. Other re-introductions would be hens for eggs and possibly chickens, ducks and geese for meat. 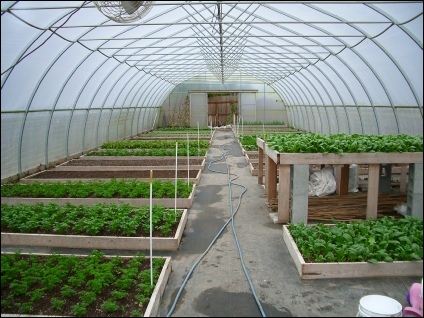 Another introduction to our farm operation in the new year is producing veggie starts for a new local garden centre and we will re-introduce our CSA (Community Supported Agriculture) program which we were unable to do in 2011 due to bad weather and growing conditions. We will continue with our Vegetable Gardening Course – a one day per month for six months program – where people will be able to learn from our experience and the countless mistakes we have made over the years, and also our bee-keeping course which we teach on the farm in conjunction with the Kootenay Local Agricultural Society. As you can see, we do a crazy number of things…. Just the two of us… and we hope you like what we have to offer. We thank you for visiting our website, feel free to browse our pages, and we welcome comments and feedback. Remember your decision to purchase products locally means you are directly supporting small scale local agriculture here in the Kootenays.